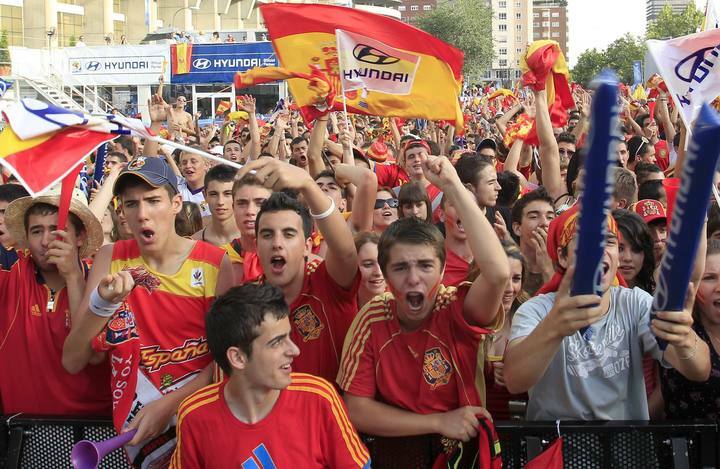 Here's a picture of some of the crowd outside of Bernabeu (Real Madrid's stadium) where I went to watch the game tonight. There are big screens of the game all around the outside of the stadium, and it was just jam-packed with fans. I'll put up pics I took tomorrow... the one up above I snatched from a news site. The people just went wild though. After the game, everyone from Bernabeu left via this main street in the city, Castellana. A couple cars were trying to get through... and some of the fans would just jump on the cars in front, run across the top of the vehicle and jump off in back. They'd go 3-4 people at a time. And of course, the people pounded on the busses that tried to make their way through the crowd. Singing and pounding in the metro trains... Endless honking and chants ALL over the city. When I finally made it back to my apartment, which is now waaay on the east end of the city, all the cars out driving were honking as they went (still). This weekend was the gay pride weekend in Madrid. Thursday night I went out with some friends in Chueca, the gay district, and had a blast. I left the parade at 8 to meet up with some friends in Sol to watch the game. And what a great win it was -- the city went crazy. After the game we grabbed a bite to eat, then headed to Plaza de España where we stumbled upon a Kylie Minogue concert - part of the orgullo gay festival. The trip up north was nice and relaxing; we rented an apartment in Mutriku, a little town 40 minutes west of San Sebastian. They say San Sebastian has the most beautiful beaches in Spain. And the man tells us "we're basque", as to imply not Spanish, just Basque. Alrighty then. We spent lots of time under the sun. One particular afternoon, Izzy tells me that a group of younger girls (age 9-12 I'd estimate) were staring at her. I got up to look, and sure enough, these girls were blatantly staring at Iz and whispering to each other. Then a boy comes up to Izzy and says: "You look Hannah Montana". Izzy and I cracked up... those girls had thought Izzy was Hannah Montana! And after that first boy initiated contact, Izzy was instantly surrounded by 15 little kids, shooting her questions left and right about her life. Then one kid wanted to jump into the water with Izzy, so she did it and the kids were chanting "Is-a-belle! Is-a-belle!" It was hilarious. Bottom left in orange: "Huelga general"
We take a stroll through town to find the tourism office, to see if there are any other busses to San Sebastian. Tourist office: closed. There's a sign saying that the office is closed due to the strike, but that it will be opened tomorrow. So we realize we're "stuck" in Mutriku for the day (can't complain about being stuck in a goregous little town on the ocean...). Venture around to try and find food. The only grocery store in town: closed. Every single bar: closed. Then on Wednesday we had a little under two hours in San Sebastian between busses, so we ate at a nice restaraunt there. This morning I went to the airport with Asad; he headed back to the states today. After some studying, I met up in Retiro Park to say goodbye to my friend Melonie; she heads back home to Germany tomorrow. Then tonight I had my last English class with Pablo. And now I'm off to cram what I can in the next two hours before bed. Exam tomorrow morning! The university had a strike one day earlier in June, so all the exams that day got moved to the 21st. Oh wait, that's today. So since the beginning of June there's been new graffiti all over the university, referencing the "huelga general". (When people are protesting something here -- which it seems the students are always doing -- along with the posters throughout the buildings, people spray paint on the sides of buildings, staircases, cement benches, everything. It's the norm, but kind of a shame since the buildings are so old and historic. The reason I'm sharing this word today is because we just found out there will be another huelga - this time by the metro, June 28, 29, and 30. We don't know yet if the entire metro will be closed down, or if they'll leave a few lines running, but very likely the whole thing could be closed those three days. Well, I'm off to the library - exam is Wednesday morning. Eek. In English, you add another coat of paint. In Spanish, it's mano (which also means hand). When Gregorio gets home from work in the morning, the two head over to the new apartment where they pass the day working. Around 6 or 7pm, depending on when Gregorio works that night, he drops off his mom at our apartment, grabs his work clothes, and is out the door. Works all night, then repeat. I don't know when this man sleeps. 2 more manos to go! That Saturday we spent in Sevilla, and Sunday afternoon I caught a 7 hr bus back to Madrid. Last Thursday-Sunday I spent a long weekend out of Madrid, in Granada and then Sevilla. The whole town was gorgeous. Later that night walking around town, we stumbled upon a free flamenco show. Apparently we had picked a good time to go to Granada - there was a festival until Sunday, and that's why there was the flamenco show. It was actually the first flamenco I'd seen in Spain, and I rather enjoyed it. The next day we walked through Albaicín, an area of Granada with narrow winding streets displaying its Medieval Moorish past. At the top of a hill, there was a great look-out point. We could see la Alhambra with the snow-covered mountains in the background. That evening we went to a couple different places for cañas and tapas, since she and I don't usually go out for tapas in Madrid. That night we stumbled upon another flamenco show in the same plaza as the night before, so we sat down and stayed until the end. The next morning we headed off to Sevilla. Granada is now, without a doubt, somewhere in my top 5 favorite cities I have visited this year. The whole town was gorgeous, stuck in the past. Green, green, green, with beautiful aged stone.